Sony PlayStation 3 Game published 11 years ago by NAMCO Bandai Games, Inc. 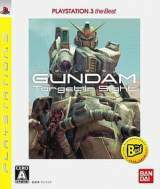 Mobile Suit Gundam - Target in Sight © 2008 NAMCO Bandai Games, Inc.
PlayStation 3 the Best edition. Released on March 19, 2008 in Japan.